The study and practice of Art is an intellectual activity, as cerebral as it is cognitive, however excellence can only be achieved through engaging in both activities simultaneously. Creativity cannot be effectively realised without an understanding of the foundations of the subject, but they can be taught in a fun and, most importantly, hands on way. For instance the science of colour means very little when explored in theory, but in practice the concept can set the imagination and the work on a wonderful creative journey of discovery. Similarly, Art history can appear dry or irrelevant, but when taken in context and explored practically, it will give the children an understanding of why, when and how artists have worked and this can develop in turn into informed and highly creative work. 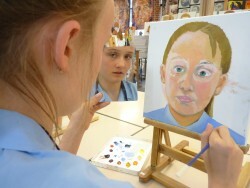 The combination of practical skills with sound intellectual enquiry is at the heart of Art at Cranleigh Prep, and through this engagement the children grow in confidence both in their practical work and in their intellectual grasp of the decisions they have made, this being further informed by the Art history they have studied. In the Art Department the academic and creative approaches are seen as synonymous, each giving strength to the other. For further information about projects, skills, etc, refer to the Creative Arts section of the website.